I love unpretentious food, prepared well. I also love playing with presentation. This is an incredibly easy recipe that captures the best of both - every time I've served it, guests have been terribly impressed. If you don't tell them how simple it is, I won't either. Deal? 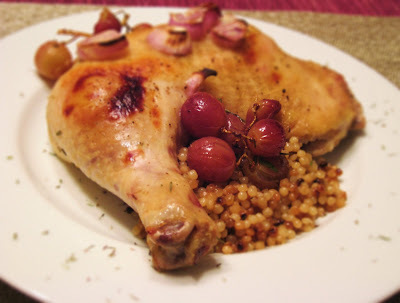 I like to serve this with Israeli couscous cooked in chicken stock - you can make this in around 20 minutes while the chicken cooks. The trick to this dish is not to overcook it - chicken should never be dry. Meat continues to cook even after you take it out of the oven, which is why it's so important to let it rest - if you allow it to roast until it's fully cooked in the oven, by the time you eat it, it'll be dry. Fortunately, dark meat is quite forgiving. Place the chicken in a large casserole dish (most oven safe pans will work) and tuck grape clusters into the spaces between the chicken legs. Sprinkle shallots on top. Roast until the juices run clear, around 30 minutes. Allow to rest for 5 minutes. It seems very delicious. I will give it a try next week end. Thanks for simple and easy recipe.